Teacher and administrator certification is more complicated than it appears in most states, and Alaska is no exception. With a series of recent changes to teacher certification in progress now, it's especially important to realize that we are not the "the experts". This section of our website is only meant to provide an overview of the process and requirements. The Alaska Department of Education (EED) maintains a very useful certification area with accurate, up-to-date info. Oh, we know a little about this topic, as we have followed the regulations ourselves for years as school administrators, and hosted many virtual chats with EED staff on the topics, but for current, accurate answers that can impact critical life decisions,it's always important to get answers about your specific situation direct from the source, not from a third party website or an online forum. » Important Note: You need to get specific certification questions answered from Alaska EED! Each state has its own hoops to jump through in the form of regulations, statutes, requirements, restrictions, background check procedures, and reciprocity agreements with other states. Although the Alaska Department of Education makes every attempt to help candidates navigate these requirements, it WILL be different than where you are from! Start early, keep a positive attitude, and be detail oriented. If you meet the requirements as outlined on the application forms, you will end up with a certificate. All teacher and administrator candidates must be fingerprinted, and pass an FBI background screen. Almost all certificates are the same price – $200, plus a $60 Fingerprint Fee. Likewise, nearly every type of certificate requires either an Institution Recommendation (IR),or a State Recommendation (SR). The Multicultural (MC - 3 credit hours) and Alaska Studies (AK - 3 credit hours) courses required are almost always completed in the two-year interval after you are hired, and already working in Alaska. Typically, distance education methods are used for these courses. Special Education is different in some ways. For those interested in teaching Special Education to children with disabilities, in addition to meeting other requirements for teacher certification, no matter which certificate you apply for, you must already ahve an endorsement based upon completion of an approved teacher training program in Special Education. Initial/Two-Year, Three-Year - It's a two-year certificate, really, that requires a passing Basic Competency Exam (BCE) score. Renewable for one additional year in some cases. Usually gives you two years to do AK and MC credits. Initial/Out-of-State - This is a one-year certificate for those with active teacher certificates / endorsements in other US states and territories. In some cases, it can be extended for two (2) one-year terms. Also requires passing BCE score. Initial / Program Enrollment - One-year certificate, but renewable for two (2) one-year terms in some cases. Requires current enrollment in an approved teacher preparation program. Must already have a passing BCE score. The program you are enrolled in can't be in Special Education, sorry, and must be completed within two (2) years of the issuance of the Initial certificate. They will check on your progress each year with transcripts to make sure you are on track. Second Initial Teacher Certificate - This is a fairly complicated, three-year certificate that is unlikely to apply to teachers new to Alaska, and relatively few who have taught in the state. Basically, if all of the requirements for a Professional certificate (below) are met, with the exception of the two years of teaching experience & the content area exam, an applicant may apply for a Second Initial certificate instead of a Professional certificate. Professional Teacher Certificate - A five-year certificate for teachrs who have already had an Initial Certificate of some type, two-years experience, have passed some form of BCE. Important: If you are returning to Alaska after having taught here in the past, or are renewing, the Professional Certificate now requires passing scores on the appropriate Content Area Exams for your certifiation area. Returnees from out of state who meet some criteria can instead apply for a Initial/Reemployment Teacher certificate instead. See FAQ below. Master Teacher Certificate - Teachers who have passed the National Board exams ( NBPTS), and met the other requirements for a Professional Teacher Certificate, may apply for a 10-year Master Teacher Certificate. Type B Administrative Certificate - This is a five-year certificate that requires at least three years of certified teaching or special services work. The requirements for a Type B certificate in general are very similar in most other ways, and require completion of the AK and MC course requirements. There is requirement for a Basic Competency Area or Content Area exam. There are several types, however, so we recommend you check on which admnistrative certificate is best for you. It seems that many of the teacher certification changes proposed in December, 2015 are being phased in this summer, and over the coming school year. As metioned on our Teaching in Alaska page, there are also concurrent changes happening due to ESSA (formerly NCLB) regarding accountability, "highly qualified" status and education standards. You will want to review those in addtion to the certification information contained here. Appears to allow endorsements / content area on initial applications in areas other than major / minor or named program if Content Area Exams are passed. I'm not sure on this one, so see the highlighted text in images below. Changed the list of Basic Competency Exams (BCE) that can be used. Now includes the ACT / SAT. Starting June 30, 2017, all teachers who have never been certified in Alaska or another state, as well as those applying for renewal of their license will need to prove satisfactory completion of training in four new areas. Important Note: This means that newly minted, just graduating teacher candidates, and those just completing their teacher preparation programs will want to have their completed Alaska Teacher Certification packet submitted and received by Alaska EED no later than June 29, 2017 to avoid the new training requirement. Teachers with an existing and valid teaching certificate in another state or US territory can apply for an Initial Out-of-State Certificate, and be exempt for one year. Since Alaska is only able to provide about 33% of its annual demand for teachers from in-state university pre-service programs, it is a fact that most teachers are originally recruited from other parts of the country. Teacher certification is handled by states, and most teachers are certified in the state in which they finish their pre-service endorsement program, or where they are working now. Question: Does Alaska have reciprocity with other states? It's not exactly reciprocity, no. Reciprocity implies that a license in another state exempts a teacher from needing one in the state with reciprocity. Alaska still requires all teachers to have a valid Alaska certificate prior to the first day of instruction. However, having certificate in another state or US territory does make getting one in Alaska much easier. 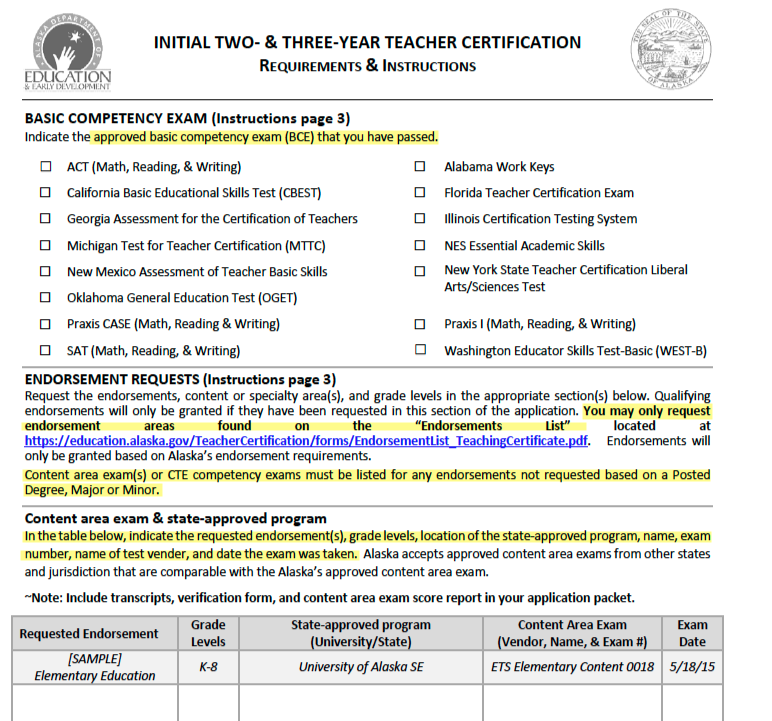 As specified above, most teachers certified in another state will want to apply for an Initial / Out-of-State certificate. But, it at a minimum seems to smooth the path for a one-year certificate while other requirements are met. Although it is a one-year, certificate, it may be reissued twice for a total of two (2) one-year extensions. It will bear the same certification area as your other state of certification. Depending on whether you have already met the Alaska basic competency examination requirement or not elsewhere, and completed a Bachelor's degree and teacher preparation program - which most teachers have - this certificate would be valid for a period of up to 3 years. This is important, as Initial Out-of-State certificates are non-renewable. All holders of Initial type certificates have to complete the requirements for a Professional or Master certificate during the validity period of their Initial certificate. Question: My Alaska certificate has expired? Which certificate would I get? If your Initial Alaska certificate has been expired for 12 or more months, but was valid for at least two years, then you would apply for an Initial/Reemployment Teacher certificate. It will reflect the certification area of your initial certification. This certificate is non-renewable, and you must next apply for a Professional certificate. Question: What if I'm considered a master teacher, or have a lifetime certificate in my home state? All teachers new to the state start with Initial certificates. There is no difference in pay or benefits. But, after having held an Initial Certificate, and passing the National Board exams ( NBPTS), you will quality for a 10-year Master Teacher Certificate. The term "alternative certification" or "alternative route to certification" usually describes programs that do not have all the components of a traditional, pre-service teacher preparation program. Please note that Alaska no longer issues "emergency certification", nor does it allow anyone who is not certified to work as a teacher. You must either arrive with a current, valid certificate from another state, or be enrolled in an approved teacher preparation program in order to be certified. Approved pre-service programs will require an Institutional Endorsement form. If the certificate you have is from an Alternative Certification program in another state, you will need a State Recommendation. Many states also have programs for non-typically prepared persons who have other degrees. These are usually called "Alternative Routes to Teaching" in the literature. In Alaska, other than the Initial / Program Enrollment Certificate, there is no officially sanctioned "Alternative Route to Certificaion" that I can find. Before committing to any teacher certification program, online or otherwise, please check with Alaska EED to make sure you would be qualified to work here after completion. The Troops to Teachers program provides counseling, financial assistance and scholarhips to armed forces members wishing work as teachers. Troops to Teachers started in 1994, and is intended to assist qualified military personnel make the transition from the armed services to service in the classrooms. The program helps connect individuals with information, institutions and the people that can help participants in meeting existing state certification requirements. Assistance in finding a teaching position is also provided. » Stipends (up to $5,000) have previously been available to help defray the costs of certification. » Bonuses (up to $10,000) for those who commit to teaching in "high needs" schools for a minimum of three years have previously been available. Eligibility guidelines for military service are pretty specific, so check out the official contact list from DANTES, which lists an address in Colorado, or download the lastest official brochure I could find here. There are several specialty certification areas with more complex, and specific requirements. Some of these include School Psychologists, Speech Pathologists and and Hearing specialists. Please see the EED website for details.